The industrial dispute in California that I blogged about this afternoon can now be pursued online. 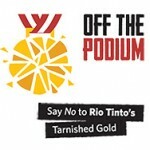 The International Transport Workers Federation (ITF) has issued a call to email protests to Rio Tinto between the London AGM of the company on 15 April and the Melbourne AGM a week later. Take a few seconds to send the company an online protest letter, and encourage your friends and workmates to do likewise. You can also send a solidarity message to the workers’ union.